Hereby I publish a dark theme I made for vim. This is a theme I personally use for quite a while now and over time tweaked to my liking. 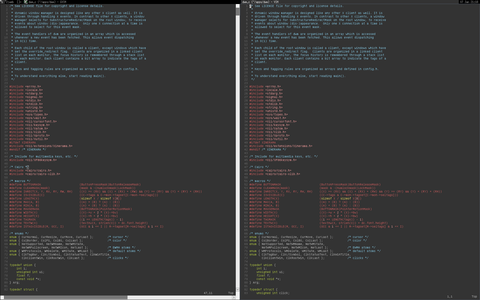 It is made for gvim, but also works for 16-colour terminals (with small visual differences). The relaxed.vim file also has my .Xdefaults file colours listed at the top for 16+-colour terminals on X. It is inspired by the "desert" theme available at https://www.vim.org/scripts/script.php?script_id=105, although I removed the cursive and bold styles and changed some colours I didn't like.